The Association hosted Assemblyman Bob Wieckowski (25th Assembly District – Fremont) for a tour and meeting with agricultural organization leaders, including California Citrus Mutual, California Fresh Fruit Association, Nisei Farmers League, Western Plant Health Association, California Rice Commission, California Dairies Inc. and the Raisin Bargaining Association. 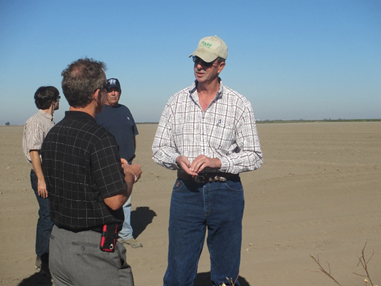 The day began with a visit to Firebaugh area almond and cotton grower Mike O’Banion to discuss the impact of the drought and lack of surface water in California. Representing the Association on the tour were President/CEO Roger Isom and Director of Technical Services Christopher McGlothlin. The group then visited Olam’s Silver Creek Gins. After that the group returned to the Association’s offices for a lunch and meeting with the participating agricultural groups. The tour and meeting was part of the Association’s ongoing effort to reach out to urban legislators to educate them on the critical issues impacting agriculture in the state.